Well Yesterday was 9/11. So I will post on that topic. It was a Friday 8 years ago that the face of terrorism and America were changed, by two planes, that were hijacked by the terrorist. It was a turning point for America just as the battles of Gettysburg and Vicksburg where major turning points for the Army of the United States during Civil War. Gettysburg was the blodiest three days in the Civil War. It was also a major turning point for the Army of the Potomac. Herman Haupt was a Union General who greatly revolutionized the movement of troops and supplies via the railroad system. John Brown attempted to start an insurrection among the slaves but, his plans were foiled by the U.S. Army. The Dahlgren gun was mainly a navy gun it was a breech loading gun. 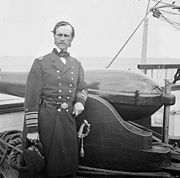 The man in the picture is John Dahlgren the inventor of the Dahlgren gun. 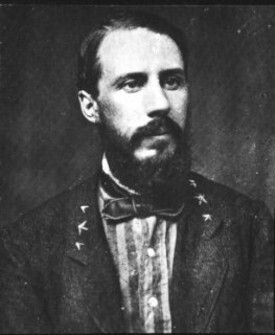 Edward Porter was the man in charge of the enourmas arttilery barrage just before Picketts Charge at Gettysburg. This Field hospital was outside of Richmond.Field hospitals were where the wounded would be transported during a battle or before they could be transfered to a more permanent hospital.